ST GEORGE – Officers responded to a report of a car collision Sunday afternoon in the area of Man of War Road and Bloomington Drive. When officers arrived on scene they found a silver car had left the road and crashed head-on into a tree. Peyton also had his child and a friend of his child in the car with him, Lewis said. Although he would not release the ages of the children, Lewis said that they were minors. “We located the driver Brian Peyton two blocks away with both children, trying to get into another vehicle,” Lewis said. Officers on scene said they had probable cause to believe that Peyton was intoxicated, Lewis said. Peyton was then arrested on scene, and transported to Washington County’s Purgatory Correctional Facility. 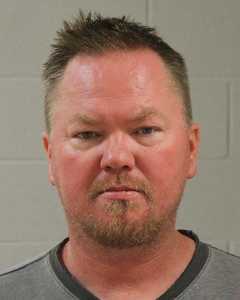 He has been charged with leaving the scene of an accident with injuries – a class-A misdemeanor; improper lane travel – a class-C misdemeanor; and driving under the influence with a child in the vehicle – a class-A misdemeanor. Peyton’s bail was set at $2,582 and, as of Monday, Peyton has been released on bail. It was a son. not a daughter in thecar. Thanks J, may be a confusion of words; although the transport to Dixie Regional was not related to us by the the police, understand that persons are often taken to the hospital for medical clearance (which may include testings for alcohol or drugs) in the custody of an officer before being transported to Purgatory for booking – as arrest means an actual restraint of the person or submission to custody, it would encompass the process including the intermediate stop at the hospital.